A tasty Psych/Doom/Stoner vinyl split outing that really should take you on a far distant trip. Yes, I'm still covering vinyl splits, for the moment. But at least this one is an unambiguous, proper EP-length, 12" - none of your borderline single releases here. 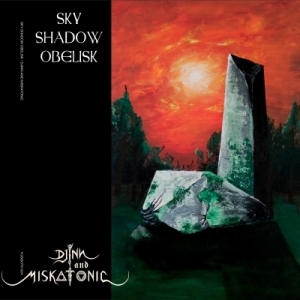 Obviously, it wouldn't seem like a proper Sky Shadow Obelisk release if there wasn't something quite lurid about it. In this case, though, it's the format rather than the music: a weighty slab of orange/green vinyl that looks decidedly trippy when spinning. Somewhat no-frills apart from that, you get the necessary credits on the back of the sleeve, and, erm, that's it. So be it, I've owned plenty of less informative LPs since way back when, and at least these days there's the internet to give that some informational backup if you want it. Perhaps the most important fact, though, is printed square at the top: a dedication to the late Jon Rossi of Pilgrim, tragically passed away at the age of 26. Anyways - don't take this the wrong way, as we spin through the Sky Shadow Obelisk side. I'm not remotely setting out to criticise Peter Scartabello's approach to music, or his fondness for weird time signatures, strange tunings and microtonal experimentation. But I would say those can be tough - if not sometimes impossible - things to absorb and properly appreciate if you're more of a 'straight down the middle' listener looking for some doomy vibes. So I do welcome the way SSO have steadily drifted towards a more readily embraced position - I'd hesitate to say 'mainstream', because they're certainly not that - but certainly something that does offer a greater degree of general accessibility. Because that makes it easier to get into the band - and you can always explore the back catalogue, with a better insight into those harder-to-digest elements, later on. Effectively continuing the warmer and more identifiable sound of preceding EP 'The Gift Of Light', without in any way diluting the deeply hermetic Lovecraft/Ashton Smith-type stellar secrets of the lyrics, 'The Alogon' (from the Greek - meaning the irrational, or unthinking, part of the soul) blends occult mysticism with a nice line in radical musical contrasts, shifting between acoustic and Death/Doom segments, beauty and beast vocals, and finding space for a guitar solo that wouldn't sound out of place on Californian loons Spirit's early albums. Actually, come to that - 'Twelve Dreams Of Dr. Sardonicus' isn't a bad point of reference, if you compressed the whole thing down to 12-odd minutes and threw in some serious "yet-to-be-invented-in-1970" Death growls on top. A deep and subtle Psych/Doom trip to savour, absorb, and repeat. On the flip side, the mighty Djinn And Miskatonic get the lion's share of playing time, with a couple of their stock-in-trade Stoner outings, which are none the worse for being utterly recognisable. Chugging uptempo riffs, sinister rasping vocals, an Eastern vibe to the compositions - they all make welcome (re)appearances. As they say, if you've got it, flaunt it, and that seems to be pretty much what Djinn... are doing here: showcasing their own particular eclectic twist on the heaviest end of the Stoner spectrum with a pretty much flawless brace of full-on stompers. By comparison with SSO, Djinn... are a more predictable counterpart. Not that I'd view that as a bad thing - it's simply that they experiment more with different mixes of the same foundation elements, rather than completely switching approaches. And, so, what you're getting here is more of an anchor in ferocious and vigorous familiarity than a question of how far off-piste it's going to go. All in all, though, it makes for a good counterpart, as far as balancing a split is concerned: an equally compelling voyage, but one that comes with a more centred and visceral urgency that'll get your neck twitching with the desire to headbang like crazy. The only drawback to this is a sadly commercial one. Shipping from the States is not cheap, and that does make the album an expensive prospect. Still, I spent my own money on it, and I'm far from disappointed with the investment: it would be quite hard to come up with an example of an equally interesting and synergistic mix of styles, where all of the tracks are equally top-notch in their execution, in recent years. Thoroughly recommended - if you can afford a copy, I wouldn't hesitate in grabbing one while they're still available. Visit the Djinn And Miskatonic bandpage. Visit the Sky Shadow Obelisk bandpage.